(Important Note: Chim’s is seasonal, only open from late Spring to early Fall. Check before heading out there, although the campground serves breakfast year-round). Every once in a while when doing this blog I stumble upon a real gem, finding really good food in an unusual setting. In this case, it involves going to a campground; from Columbia, you head south on Providence, follow it around as it become Highway K, and look for “Old Plank Road”. Following that for a bit, it branches and if you take Smith Hatchery Road, and eventually you come to both the Katy Trail and the Missouri river, and the Cooper’s Landing campground. Cooper’s Landing is your basic campground, albeit with a very pleasing panoramic view of the Missouri river, but aside from being a campground, the campground store is home to a small store where you can buy beer and barbecue, and, during the warmer months of the year, you can head outside to the trailer parked at the end of the building and buy food at Chim’s Thai Kitchen. Yup, Thai food at a campground. This actually isn’t my first visit to Chim’s, I’ve been here once before back in 2007, and for some odd reason that I can’t recall, I neglected to write up that visit. 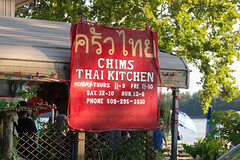 I’m pretty sure I also remember at one point going to another Chim’s location on Nifong back in town, but these days the campground is the only location, but I’m glad to see that, 10 years later, Chim’s is still doing some great Thai food. 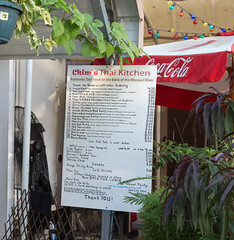 Chim’s is operating as a basic takeout food truck: you select your food from the menu, which has, for a food truck, a surprisingly wide assortment of traditional Thai dishes of both the hot and cold varieties. 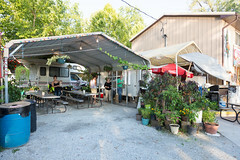 If you’d like, you can also duck into the campground store for some beer or barbecue, and then as you wait for your order to get called you can sit down and enjoy the splendid view of the river from one of the many nearby picnic tables. Looking over the many menu choices, Carol and I ended up going for a nice mix of both hot and cold. We started off with some spring rolls, and these were classic, well-executed Thai-style spring rolls, with a pleasant filling of rice noodles, bean sprouts, Thai basil, coriander, carrots, and a mix of other veggies, fried up with a perfectly crispy rice paper wrapper and some fish sauce. A pleasant, crispy start to the meal. Next up, a cooler dish: Yum Nua. Freshly grilled marinated beef with lime and fish sauce, tossed with some Thai basil, cool mint and fresh-cut red onion, and served up over a bed of rice, this makes for a really flavorful, cooler summertime dish that was perfect for sitting back and watching the river as the evening cool breezes started. 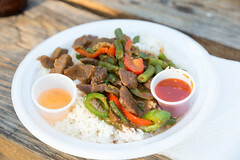 Next up was our hot dish, Pad Kra Pao: beef, chile peppers, and Thai basil served up with a pleasantly spicy sauce over a bed of rice. We always love heat in our Thai food, and this delivered a rich, spicy counterpart to the light Yum Nua. Overall, if it’s the summertime, it’s hard to beat Chim’s. 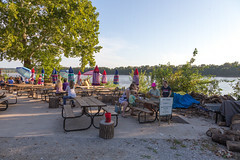 It’s a bit of a drive from downtown Columbia, but the results are worth the effort: really enjoyable Thai food, enjoyed in a pleasant outdoor setting overlooking the river, drinking a beer, and watching the river flow by as the sun sets. I’m thankful my friend Rob and Sarah brought me back out here again, and that they are still going strong 10+ years after my first visit.